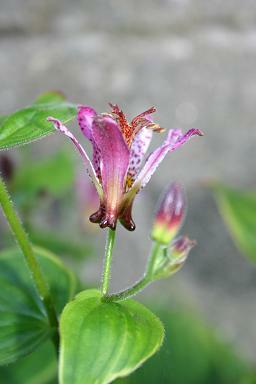 Tricyrtis formosana is native to Taiwan, but has long been cultivated as an ornamental plant. The flowers are quite variable, white to pinkish, with variable amounts of purple spotting. There are a couple of variegated forms in cultivation. 'Samurai' has a rich gold margin to the leaves. It was obtained by Clarence H Falstad III from Mrs. Masaoka of Japan.